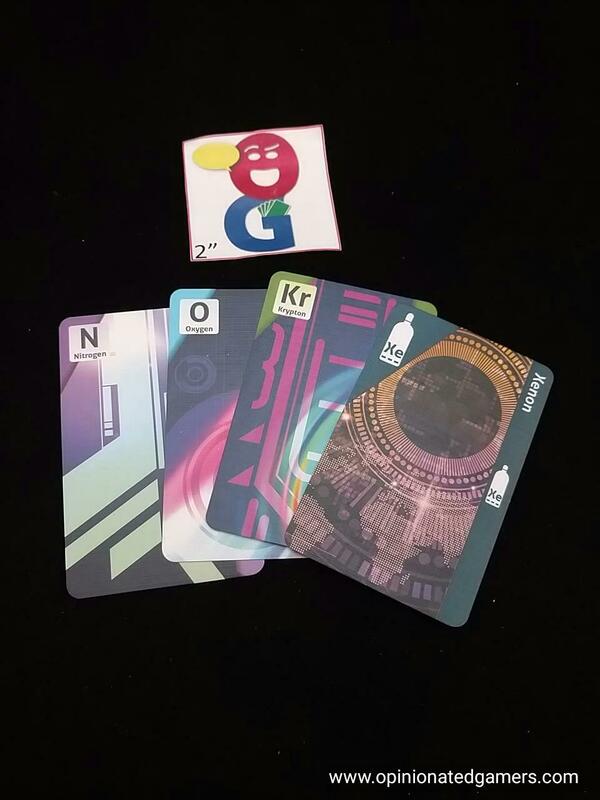 Xenon Profiteer is a new release from Eagle-Gryphon Games (Essen 2015 in limited supplies), and as it was advertised as a deck-builder, I was definitely interested in it. Each player in the game owns a Xenon distillery, and your goal is to isolate Xenon from the air around us and collect it so that you can then fulfill business contracts that give you nice star shaped victory points. Each player starts out with a console card – which also serves as your player aid – in the center of their tableau. There is room for contracts to the right, upgrade cards to the left and pipeline cards underneath. The starting deck of cards is made up of two packets of air and two basic upgrade cards. A packet of air is always 4 cards, one each of nitrogen, oxygen, krypton and xenon. Like most deck builders, shuffle your deck and draw a hand of 5 cards. The remainder of your deck remains as a draw pile. A deck of contract cards is shuffled and four cards are laid out in the center of the table as the market for contract cards; likewise, four Upgrade cards are laid out. Distill – you try to remove non-Xenon cards from your hand. In general, you can remove all the cards of one type of gas, always in the order of N, O, Kr. These cards are removed from your deck and placed back in the general supply. You may have some upgrades that you can use in this phase. If they are installed (that is, played on the table to the left of your console card) – you can use the effect in every turn. If the card is in your hand, you can discard it to your discard pile in order to use the effect once. If you have only Xenon gas in your hand at the end of this phase, all those Xenon cards are placed to the right of your console. This Xenon can be used to complete a contract card now if one is there. Take Air – If you choose to take air, you grab a four-card packet from the supply. Again, each packet is made up of one card of each of the four types of gas. You also get $2 from the supply when you do this. Wipe – You can choose EITHER the Contract cards or the Upgrade cards in the supply any discard them (as long as there is not a bid token on the card), and draw new cards to bring the total back to four cards. Buy – using money previously collected, you can buy and one card from either the Contract or Upgrade line. The purchase price of an Upgrade card is in the upper left corner. If you pay this price, you take the card and place it in your discard pile. There is another number in the bottom right, if you pay this price, you take the card and instantly install it – that is, play it to the table to the left of your console card. This card is now worth a victory point at the end of the game, and you are able to use the special ability each turn. If you end up merely putting the card in your discard pile, you can install it in a later turn when the card comes up in your hand by paying the difference between the two numbers (and this is seen just under the upper left payment price). If there is a pipeline card, you pay the cost for it and then install it under your console card. You can have one of each of the three different types, and each one installed increases your hand size by one card. At the end of the game, they are worth the square of the quantity (1/4/9 VPs). Finally, Contracts have no cost and may be simply taken and placed to the right of your console. You may only have one unfulfilled contract at a time. As soon as you have enough Xenon isolated to complete the contract – and this might be as soon as you buy it – you take any bonuses listed at the bottom and flip it over. Contract cards are worth VPs at the end of the game if they are completed. Bid – If you choose to bid, you take one of your five bid tokens and place it on any card in the market. The presence of the marker prohibits other players from wiping that card. Additionally, it gives you a $1 discount per each of your markers if you eventually buy the card. If another player buys the card, they must give you $1 for each of your markers on the card. As you are now out of actions on your turn, you then restock the cards in the market, making sure that both rows have a full complement of four cards. You then choose to discard any number of cards that you like from your hand and then draw back up to your hand size – this is normally 5 cards, but could be higher if you have pipelines installed. If you deck is empty and you need to draw, then shuffle your discard pile to form a new deck and then continue drawing. That’s what happens in a “normal” turn. However, you could decide that you would rather take an “Overtime” turn – if you do this, turn your console card over to the Red overtime side. In this case, you will have a much simpler turn. You will Distill twice – that is remove all the cards of the two lowest value types – and then you will Bid twice. At the end of your turn, after you choose to discard from your hand, you will then shuffle all your discards and your deck together to make a fresh discard pile and redraw cards to your hand limit. Of note, you cannot take two Overtime turns in a row. The game continues on to the next player. The endgame is triggered when a player has either 5 installed Upgrade cards to the left of his console OR 5 completed Contracts to the right of his console. The player who does this takes the Xenon Privilege token. He chooses to either place it on the +3VP side or the “Final Turn” side (and chooses this prior to doing any of the end of turn business – so he does not know what his final hand would be). If it is on the 3VP side, all other players will get one more turn and then the game ends. The token is worth an additional 3VP to the holder. If it is on the Final Turn side, ALL players get one more turn – which means the game ends with the token holder. However, in this case, the token is not worth any VPs. The player with the most VPs wins. Ties go the the player with the least number of Xenon cards left in their entire deck/discard pile. Xenon Profiteer is a very interesting addition to the deck building genre, and one that is different enough from other games to not feel like a “me-too” game. In fact, it’s not really a deck builder because you’re really trying to pull stuff out of the deck, not put it in! Yet, I use the term as the game does share a lot of common mechanisms with the more traditional deck-building games. You have to be fairly flexible in your strategy in Xenon Profiteer because you’re never guaranteed to get the same upgrade cards in each game. As all players have the chance to buy cards from the market, you might not get the card that you want. As a result, you will have to learn how to deal with your gas in a different way each game. The other interesting dilemma about the cards is choosing when to install the upgrade to your factory. The cost for installing a card can be fairly high, and while you then get the benefit of the card on each turn, the outlay of money can significantly slow down your engine for a turn or two while you build up cash resources to do something else. Choosing the right resource cards is key. You want to try to have upgrades that work well with each other in order to make nice combinations. You also want to be focused in choosing which cards to install – because you only get a chance to work with four of them installed as your main engine, because as soon as you install the fifth one, you’ll only have one more turn (at most!). Another very interesting decision is made at the end of the game when the player who triggers the endgame gets to choose between the guaranteed 3VP printed on the token or taking another turn – with nothing being guaranteed… And, to further complicate things, you have to make your decision before you see the new cards in the market AND before you see your final hand. I’ve not seen many games that give this sort of decision point, and while I’ve only had to make in once in my five games, it’s a nice twist. 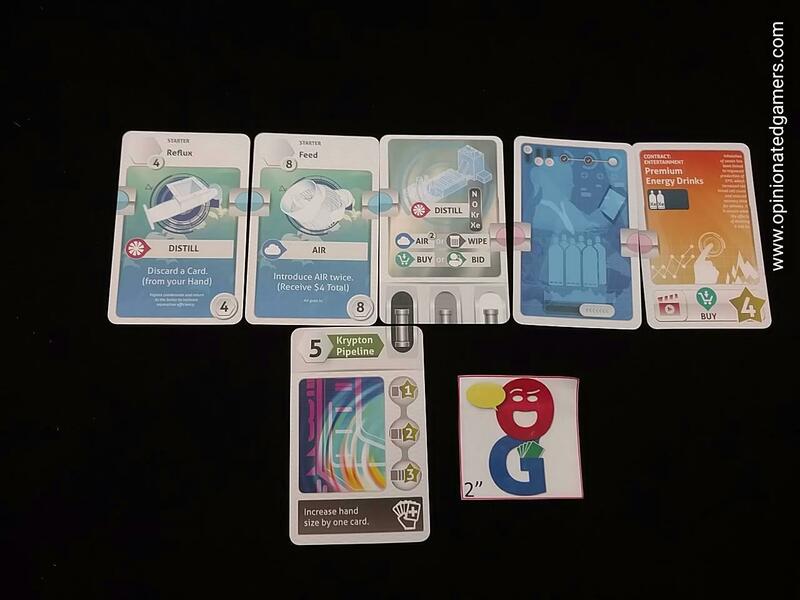 The game has a tendency to move quickly, and our games have sometimes turned into a race between the efficient engine builder rushing to install five upgrades before the contract-fillers get a chance to complete the higher scoring contracts. This turns out to be a viable strategy as most of the upgrades are worth a single VP, and you should be able to complete a small contract or two along the way. 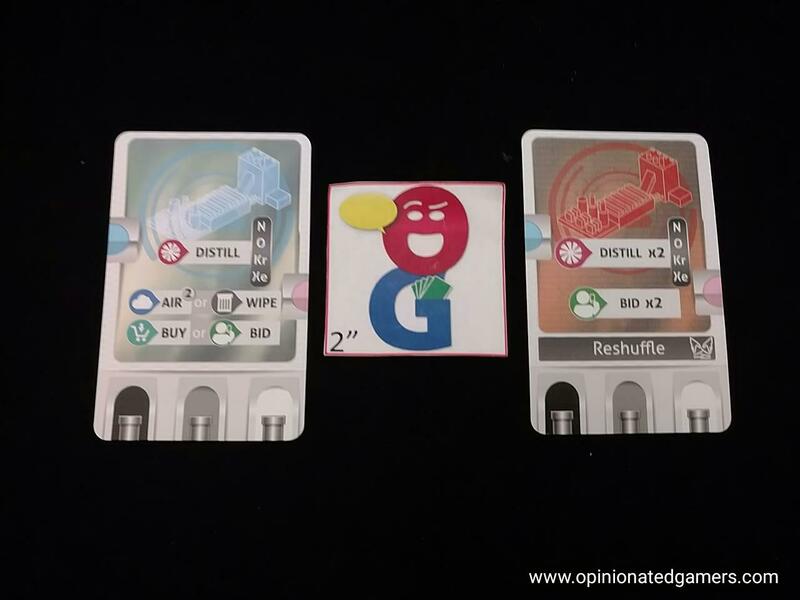 Each round goes fairly fast though the distill phase – you generally know what you can do with your cards and your installed upgrades prior to your turn starting. The delay, if any, is choosing from amongst the possible cards to buy – the market is constantly changing, and sometimes you need to wait until your turn starts to be able to weigh the possibilities. The one other sticking point are the air packets. Most turns involve collecting one, if not more, air packets – and it’s a lot of reaching over the table to draw from the stacks. We have found it more efficient to pre-build packets of air at the start of the game so that we can quickly pick up our needed air and go to the next phase of the turn. Later during the game, we try to discard the gases individually and make up new packets of air while waiting for others to take their turn. But, despite this minor fiddly point, the game plays well and the varied Upgrade cards allow you to construct a number of different engines to get your Xenon out of your hand. 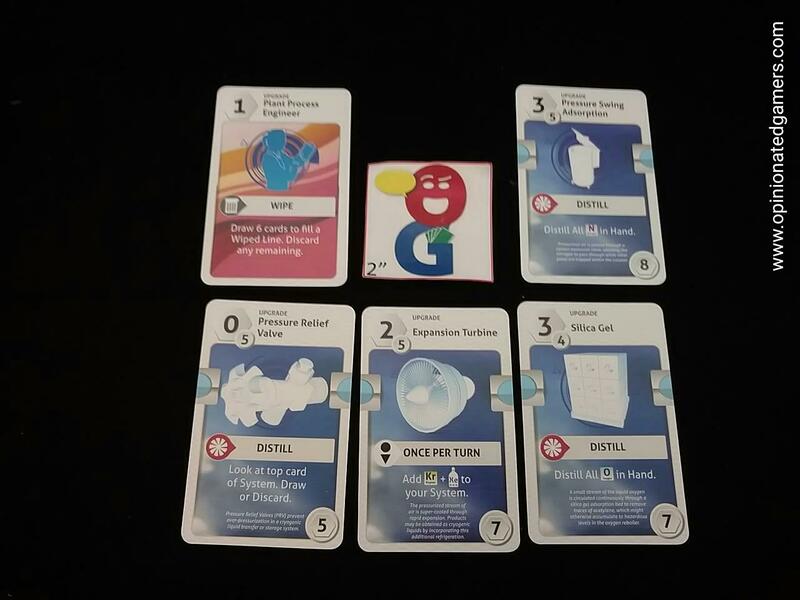 There is at least one expansion set of cards available so far which add some new Contract cards as well as Profiteer cards to the system, but thus far, we have been quite happy with what’s available in the base set. Dan Blum (2 plays): I’m not a big deck-building fan – I like Dominion well enough, but I don’t love it, and I think most of the other deck-builders I’ve tried have serious flaws (as opposed to other kinds of pool-builders, some of which I like). I actually rather like Xenon Profiteer, which avoids most of the issues I see with other deck-builders and (as Dale notes) feels different from them as well. That being said, I’m not sure how often I’ll want to play it. It doesn’t seem as if there are that many basic strategies, and the only one you can be sure of executing is “distill lots of xenon.” Getting points from pipelines or from the upgrades that give you extra points is dependent on those cards showing up at the right time, which they may not. This is the one typical deck-building issue the game does not avoid – having random cards to buy definitely provides variance between games, but the variance is not necessarily interesting. So right now I’m in “like it” territory but that’s partly because of novelty value, and I could easily see it slipping with repeated play. Joe Huber (1 play): I was curious to try Xenon Profiteer, but in practice found it uninspiring. 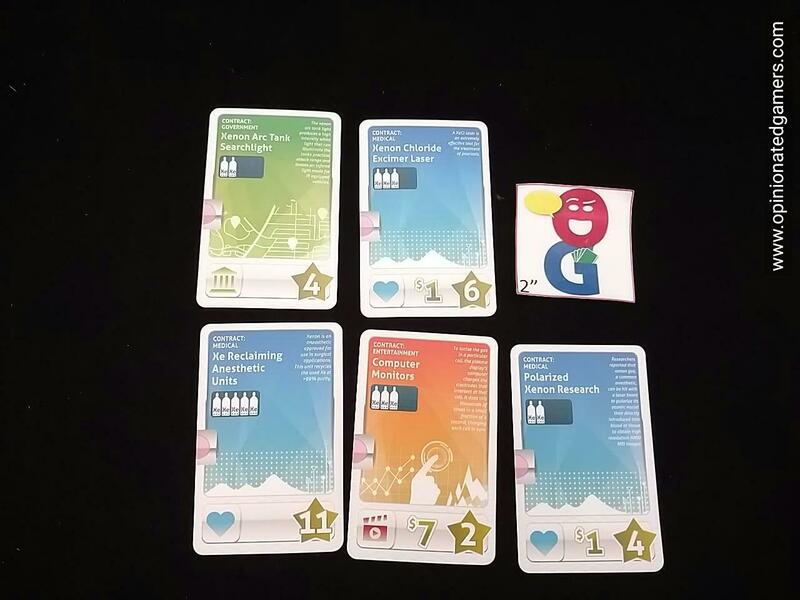 The theme is very nice, but like a number of games it suffers from conflicting random elements – the randomness of the draw crossed with the randomness of upgrades / contracts. 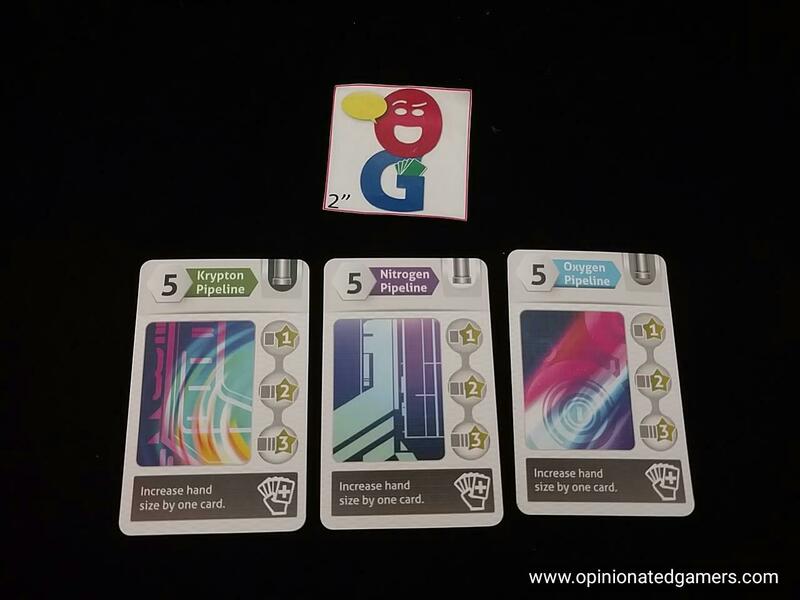 Add in my general lack of enthusiasm for deck building games, and Xenon Profiteer is a game I’m not anxious to play again. Craig V (1 play): Admittedly, deck building is not one of my favorite board game genres due the lack of player interaction and downtime between turns. Xenon Profiteer doesn’t really fix those problems, but it does offer a bit of a twist on the traditional deck building mechanism. This game is more about deck management and the creation of an efficient processing pipeline (i.e. engine) in which a player’s’ facility upgrades and system (i.e. deck) interact well together. 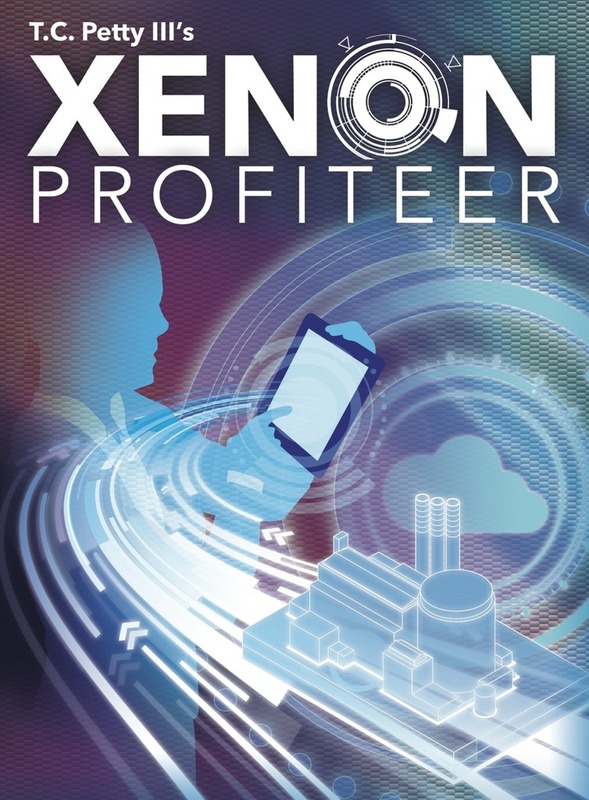 I enjoyed Xenon Profiteer because it felt familiar, yet different and offered enough strategy in a relatively short playing time to capture my interest. I have enjoyed my plays of Xenon Profiteer, although with each play the enjoyment does drop a tad. As Dan says, ultimately it is a rush to flush your hands of elements in order to get down to the Xenon. Plus, I am not sure the “Wiping” aspect is all that useful, as folks tend to place their reserve tokens on cards quickly, thereby reducing the number of cards that can be wiped. Still, the game is just different enough to keep it interesting.